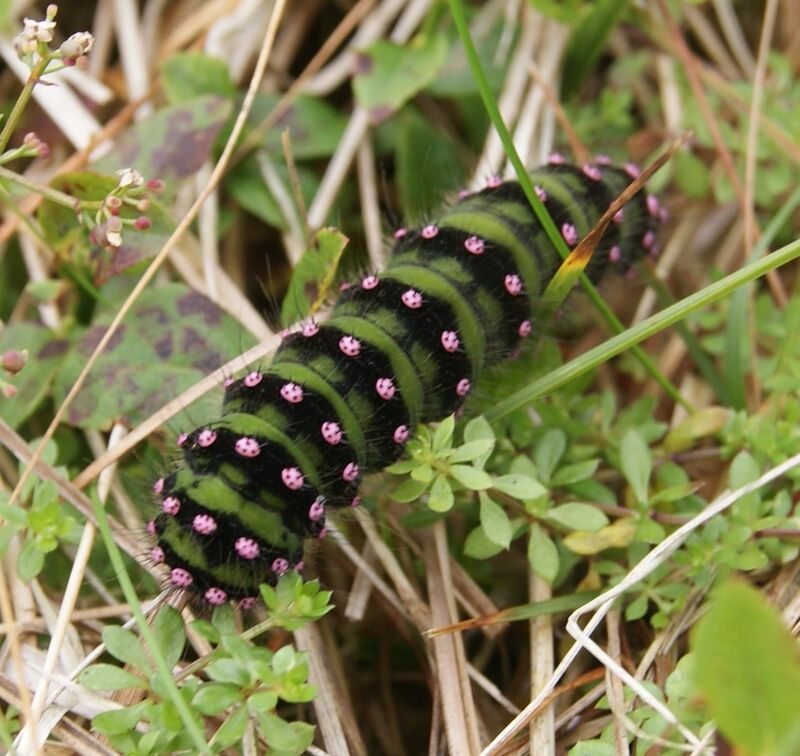 Interesting to note in brief that the last few days have revealed a number of emperor moth caterpillars at a range of ages and stages in Galloway and elsewhere. The caterpillars look extraordinary, so it’s a surprise to find just how well they are camouflaged against a range of moorland undergrowth. 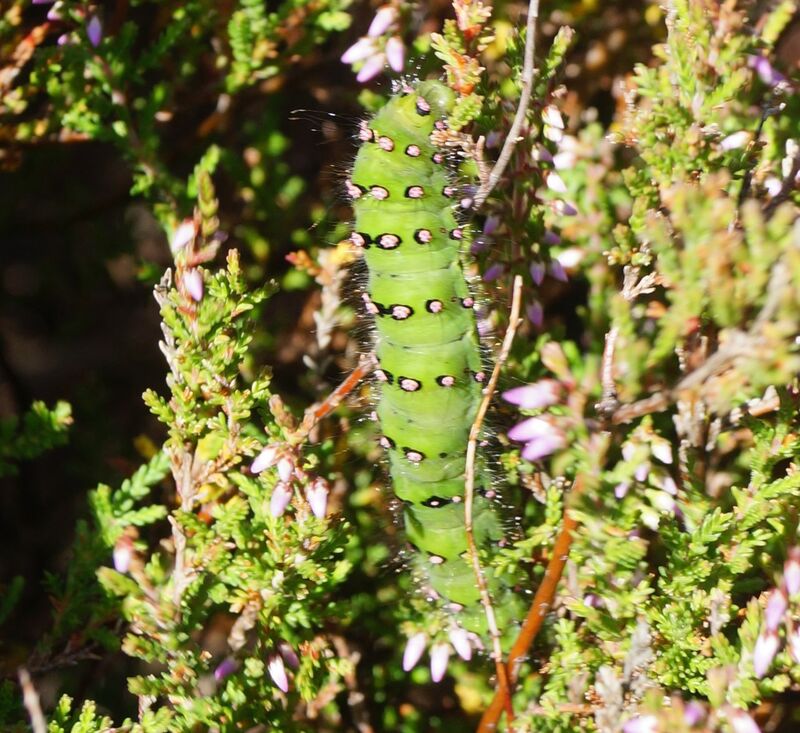 You would think that the pink spots would be horribly conspicuous on the hill, but when you see one feeding on flowering heather (as below), the overall effect is surprisingly subtle. Also, having just picked two of the little buggers off my legs, it’s worth mentioning that I have never known a year like this for ticks. The Galloway hills have been absolutely covered with them since late May, and the past few days have seen a real peak in activity. Ticks prefer some people more than others, and I am usually quite immune to their attentions. In eight years of spending at least part of almost every day on the hill, I have only had one tick get a proper grip on me. He stuck his jaws into the vulnerable pink expanse of my shoulder, and I pulled him out piece by piece with a pair of tweezers. I always imagined that something about me was relatively unappealing to them, but over the past six weeks I have found several in the early stages of vampiric frenzy, particularly in the vicinity of my ankles and in the ring around my waist. 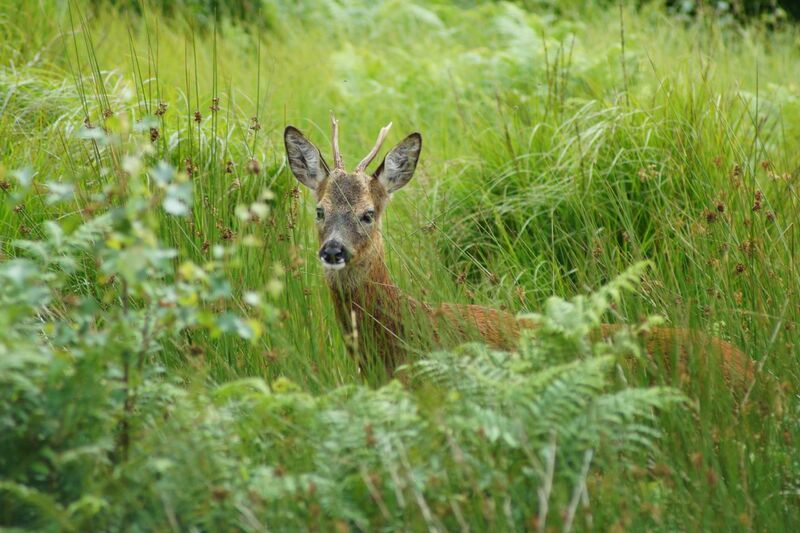 The roe have been surprisingly well populated with ticks, and a good hunt through their coats, inside their thighs and behind their ears has often revealed around a dozen engorged individuals – not a worryingly high number, but a considerable increase on previous years. The dog has hosted her fair share of both sheep and deer ticks, and while shooting in Aberdeenshire on Friday, we ended up with some very ticky hares (as per photo above). 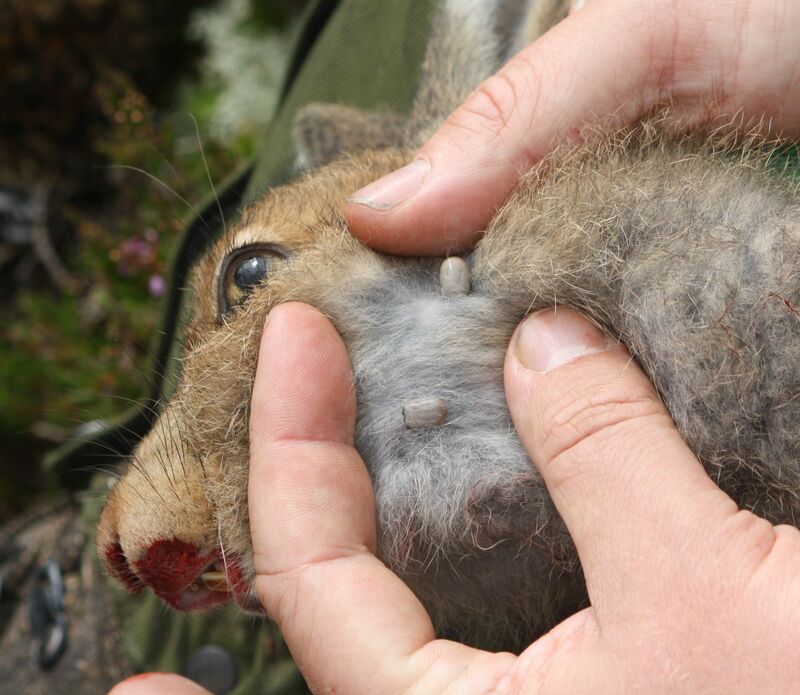 A bad year for ticks obviously has had implications for livestock and grouse production, but it also has a wider impact on the access-taking general public, many of whom are totally ignorant of the potential health implications of tick bites. The general consensus is that this has been a productive year for small, blood-sucking insects across Scotland, but from what I have seen, Galloway has been one of the worst areas. This blog has lain quiet for the past few days due to the fact that I’ve been away shooting. 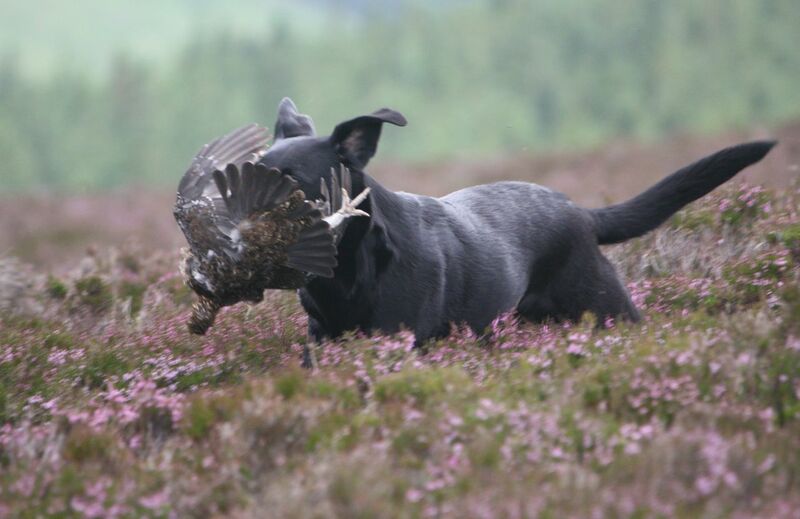 I could wax expansive on the many delightful details of sport with grouse and snipe in Aberdeenshire and Galloway, and I could try to set down the dramatic thrill of roe stalking under a rushing thunderstorm, but I am so far behind my various work commitments that I have to restrict myself to a couple of brief notes. I will make time to set down the entire experience in my own notes and these may well filter through onto this blog in due course, but the great advantage of self-employment is also its greatest weaknesses; you can have a holiday whenever you want and for however long, but you don’t get paid. Playing catch-up is the inevitable consequence of a week away. Having moaned about the end of summer, there was some pleasant compensation for the changing seasons this afternoon as I drove into town past a large gathering of curlews feeding on the yellow stubbly remains of a silage field. The rain drummed and the wind blew them over, but this was their first appearance in this part of the glen since March. Last year, they stayed throughout the winter, dropping down onto the shore only when the hard weather pushed them. I listened to them whining from the car window as the wipers groaned over the windscreen and huge shoals of swallows followed on behind the silage cutters on the other side of the hill, hunting out the flies churned up by the whirring blades. I hear that the first few pink footed geese have arrived in North Norfolk, and golden plover are beginning to gather on the marshes there. In Galloway, the larch trees have started to turn, and the mallard are well grown enough to fill the pot when their season opens in a few days. A particular highlight of my birthday weekend was in finding what seemed to be two ring ousels on the hill while stalking at first light yesterday morning. It seemed odd to find blackbirds so high up on the granite scree banks, and there really could be no other explanation for their presence as the sun burst over the Solway. There was an adult bird with a rather dowdy youngster in tow, and they flicked away through the flies as I lumbered over the crackling heather stick and spied through binoculars after them. They have not bred here, but given that the rocks are full of wheatears in autumn plumage, it feels like the migrants are already starting to pack their things and head home. I know that ousels like to stay for the berries, but the whole western side of Britain will provide them with rowans in the next six weeks, so why not take the scenic route Southwards after a cold, grim summer. Swallows in twos and threes skimmed through the midges, but the grass has grown frowsy and autumnal. Droning bees work through the reeking heather flower and cowberries shine like tiny tomatoes on the vine, but the grass is reddening and the clouds hang longer on the high ground than they did. The roe rut is subsiding, and while several bucks still avidly held their territories against the foolish transgressions of their inferiors, the does have dispersed and the atmosphere of terse, hormonal excitement has been blown into the ether. There are some reasonable coveys of grouse here and there, but many chicks are still small as they wade through masses of cotton down as if it were the aftermath of some apocalyptic pillow fight. They have not fared so poorly as it seemed, and there was enough to be seen over the course of two consecutive days on the hill for their status to be downgraded from “disastrous” to merely “disappointing”. By night we went lamping on the low ground through the silage fields and the churning swarms of flies and moths. Fox cubs ambled fearlessly between the cowpats, and hares turned their ears in confusion as the torchlight made them glow. This is the gap between high summer and the sudden descent into autumn – the final breathless wheeze of life before the rush of decline. The haws are in the greenroom and the rowans are rouging. Quite astounding to read the announcement this morning that the RSPB aims to translocate golden eagles from the Highlands to the Southern Uplands in a bid to improve the species’ conservation status South of the Highland line. This flies in the face of the perpetual notion that gamekeepers are killing all the eagles by implying that the Highlands have eagles to spare, and it also provides a major conservation charity with a wonderful, crowd-pleasing headline. I’ve written about the shortage of eagles in the Southern Uplands several times before on this blog, particularly in Galloway where the reason for their absence is staggeringly clear. I have probably covered the subject so often and in so much detail that I should start beating my head on a brick wall, but the logic is so straightforward that I almost can’t believe some of the decisions made by the “professionals”. But what a headline! Golden eagles to be brought down from the highlands to boost ailing stocks in the South! The story segues so beautifully into discussions about raptor persecution that journalists just have to cut and paste comments from the Scottish Minister and readers can “tut” and shake their heads to their hearts’ content. I could write for weeks about how dearly I’d love to see eagles across Galloway, but if we want them in the South West, we have to provide them with more than just a lovely view. Some Galloway eagles are already being fed on artificial feeding platforms, suggesting that the real spanner in the works is not the politically high-octane notion of “persecution”, but more a simple, fundamental lack of suitable food. The RSPB have been proud to release red kites in Galloway for fifteen years, but a huge number of these are fed from an artificial feeding platform at Laurieston, making them little more than feral scavengers. If the reintroduction had been a success, these birds surely wouldn’t need the meat they are given, and it seems that their purpose is now little more than a kind of fund-raising tourist magnet. What a travesty it would be if the same happened to eagles, and they were brought to an area that could not support them to be fed from artificial feeding platforms. Sadly, common sense makes no difference to the commercial conservation machine. If we focussed on the bottom of the food chain, the top of the food chain would look after itself. The money they are proposing to spend on translocating eagles should be invested in grassroots conservation projects which aim to encourage prey species like mountain hares, red grouse and blackgame. An improvement in prey numbers would enable higher predators to be more productive and might even draw others in over the Firth of Clyde by way of natural dispersal. It is a generally accepted rule that reintroductions and translocations can only take place where the habitat is suitable for the proposed species. Given the current state of eagles in Galloway and their dependance on un-natural food stations, it is almost lunacy to approach a translocation project in less than a year’s time without any obvious drive to enhance or improve a suitable and naturally food-laden habitat for them. 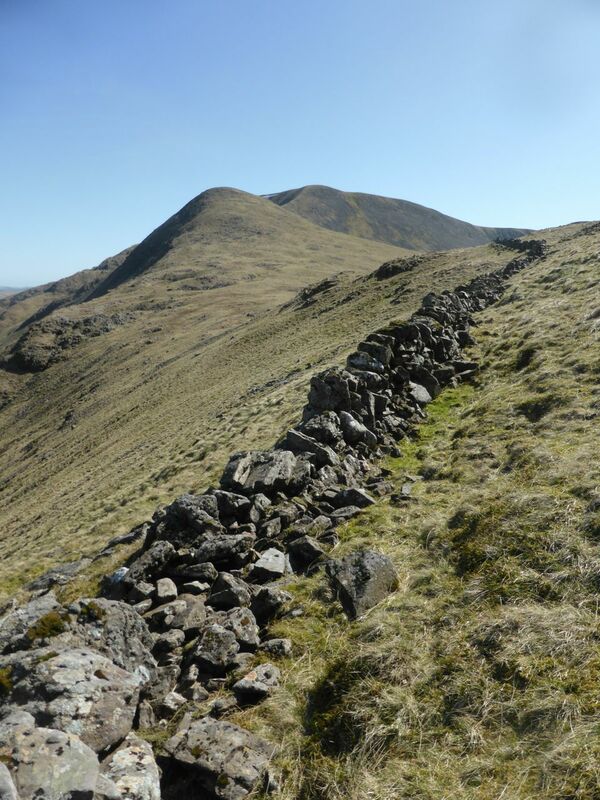 Ecologically, the Southern Uplands is on its knees. Charismatic breeding waders decline every year, and things look bleak for all kinds of species. We need a fundamental root and branch shift in philosophy to save what we have, and that has to start at the bottom of the food chain, not at the top. It would be great if eagles were being pitched as the ultimate goal for a more general revision of conservation policy, but just plugging them straight in to a broken ecosystem is bananas and does a disservice to every other species currently failing in the South of Scotland. But then again, the general public loves to see eagles more than they love the graft of careful conservation grazing, moorland management and predator control. Why do the hard work when the headlines are so easy and so lucrative? 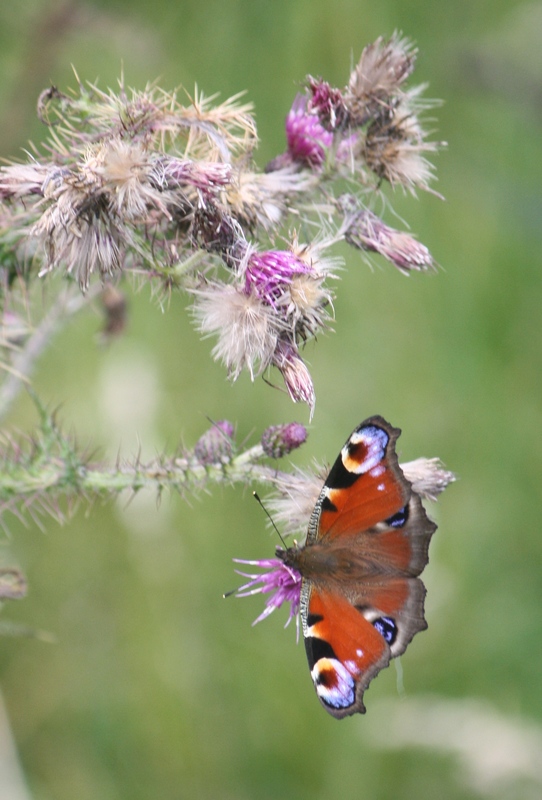 A peacock on the finched thistle heads. Despite not shooting yesterday, I did get a chance to wander on the hill for an hour or two with the dog in the early evening. This is often a particularly gloomy time of year for the Chayne, since the cavernous absence of young birds is suddenly telling. 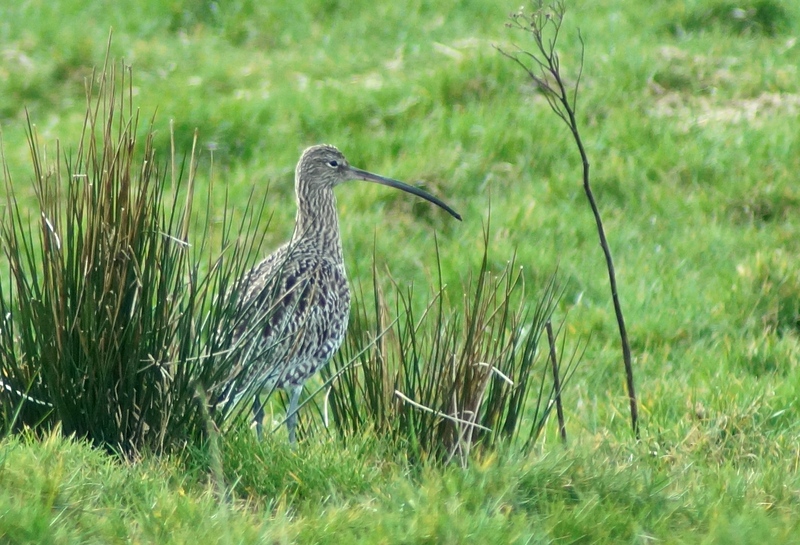 This year, all the curlews failed again and were gone by July. Even the buoyant pipits have only produced a few idle young, and their early attempts were foiled by snow, hardship and a lack of insects. By comparison to four months ago when the hill was a clear blue flux of thrilling suspense, mid-August looks very quiet indeed. I went up at first light on Easter Morning and sat in the midst of a churning world of waders, grouse and larks, all hotly anticipating the season ahead. The grass last night was more or less empty apart from whirring dragonflies and a mass of peacock and scotch argus butterflies. There are a few grouse on the hill and I didn’t really expect to find them, but this is nothing by comparison to the green shoots of excitement in 2013 and 2014, when greyhens shepherded their broods over the moss. For the past few weeks, the thistle heads have been trashed and flogged by exceptional flocks of finches, which move through the fields like African quelea, trilling and scragging every bobbing grey head of down. Goldfinches were the main participants, but there were siskins and redpolls too. Over the past forty eight hours, these daring raiders have moved on and left the hill all the more quiet in their absence. A brood of young buzzards squalled and yelled in a broken old windbreak, and their echoes just made the place feel empty. As a reminder of the appalling summer, the heather still has not flowered. The buds have been held in suspended animation for three weeks, during which time they have turned from silver to pink and little else. The best of the heather flower is usually towards the end of August anyway, but the delays are obvious this year. The blaeberry has also been slow, but it is now catching up as the leaves turn red and the berries come good. There were sheep and cows flicking their tails at the flies in the deep moss as I headed up to bring in another load of peat, which is proving harder to dry as the weeks go by. It was a still evening, with the spread of the Galloway Hills running off to the far horizon below me. A few young wagtails bobbed and two juvenile wheatears flicked over the dyke tops as I came off the hill in the lowering light. I was left to decide what had done more to dash the year’s breeding prospects – the cold, miserable summer or the perpetual, seemingly unstoppable grind of predation. In truth, it feels like the relationship between those two factors is more important than either one alone. Two dozen swallows gathered on the wires at the road end below the house, and I started to feel like the best of summer is over.